Not only a truly delicious breakfast with HEJ Natural Crunch but also a clean nutrition profile. Lots of protein, fiber and vitamins for an energetic day. Great breakfast cereal or as a snack in between meals. 1 serving with milk or yoghurt is approximately 35g of HEJ Natural Crunch. Packed with the finest plant-based ingredients like soy flakes, spelt flakes or pumpkin seeds. Naturally sweetened with dates. Environmentally friendly, sustainable and tasty! What’s good for you should also be good for the environment. Soy flakes and a variety of seeds provide over 20% protein – power for the whole day. Whenever you feel like eating healthy. As breakfast or as a snack – the HEJ Crunch fits in every bag. A variety of dried fruits, nuts and super foods naturally give you vitamins and minerals for the day. Nuts and fruits contain lots of filling fiber and provide you with long lasting energy. Start your day off right, every morning! Great nutritional values, less sugar, long lasting energy. 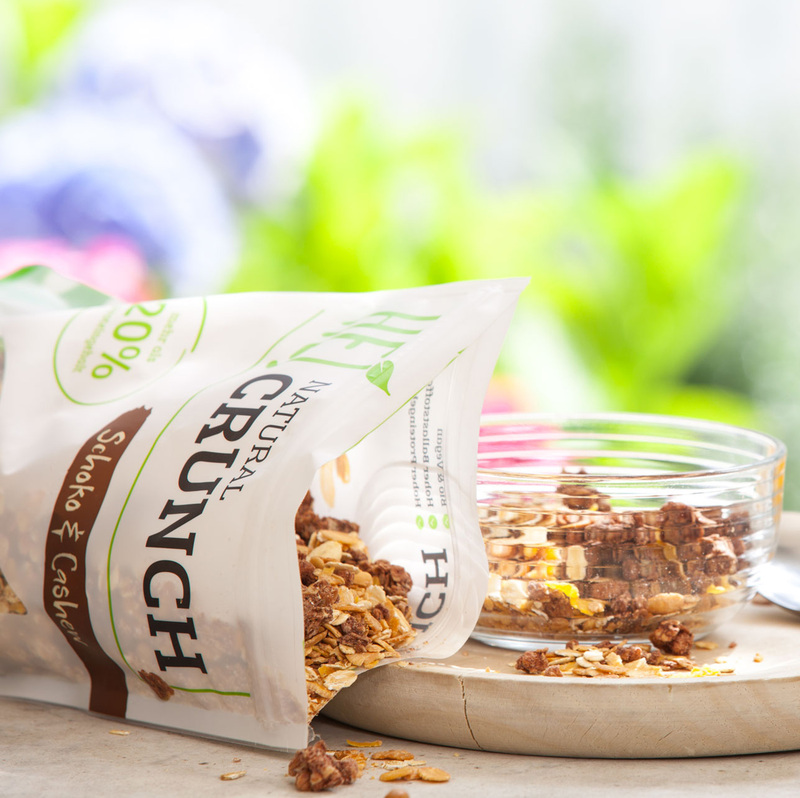 Our HEJ Crunch delivers everything you need for a healthy breakfast. How much protein is in the HEJ Natural Crunch? The HEJ Crunch contains more than 20% protein and 30% less sugar than comparable cereals. Why is organic sugar part of the ingredient list? The sugar content is 30% lower compared to similar cereals. In the incredibly tasty crunchies small amounts of organic raw cane sugar are being used to create the delicious flavor. What is different from other cereals? 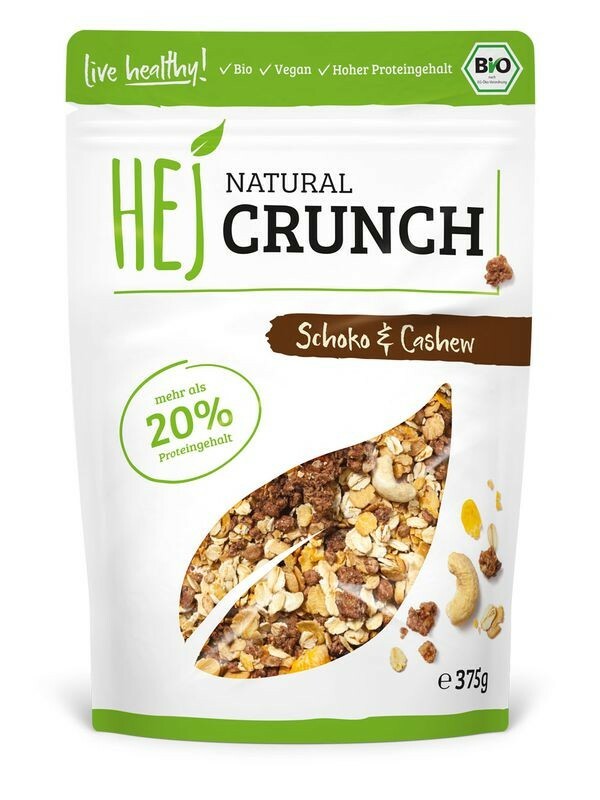 The HEJ Natural Crunch is the ideal kick start for your day. The combination of protein with delicious fruits and nuts create a taste explosion which is not only healthy but also incredibly tasteful. All ingredients are certified organic. Freeze dried Strawberries and Bananas. Strawberries and Bananas are a natural source of magnesium and potassium. Soyflakes provide lots of natural soy protein. Crispy chocolate with great oats in your healthy morning bowl. Cashews provide minerals and vitamins and many other benefits to a healthy lifestyle. Delicious apple pieces mixed with our best selling Natural Crunch! Cinnamon and pumpkin seeds make this delicious treat an ideal companion for a healthy lifestyle. Our dried organic blueberries are not only so delicious, they also contain antioxidants that protect cells from free radicals. Soy flakes and pumpkin seeds are your strong partners for the day. The plant based proteins provide power, so you get through the day efficiently. The goji berry is known as superfood and contains minerals like magnesium and iron - what a power berry! The coconut not only brings us into the holiday mood, but also thanks to its fatty acids for energy in your day. So small and so powerful! The soy flakes and seeds bring every meal to a whole new level of protein. Your muscles will love it! Strawberry & Banana variety: Contains oats, soy, wheat and barley. Choco & Cashew: Contains oats, soy, cashews, spelled, wheat and barley. Apple & Cinnamon variety: Contains oats, soy, wheat and barley. Blueberry & Almond variety: Contains oats, soy, wheat and barley. Coconut & Goji: Contains oats, soy, wheat, almonds and barley. May contain traces of nuts, peanuts, sesame seeds and milk.